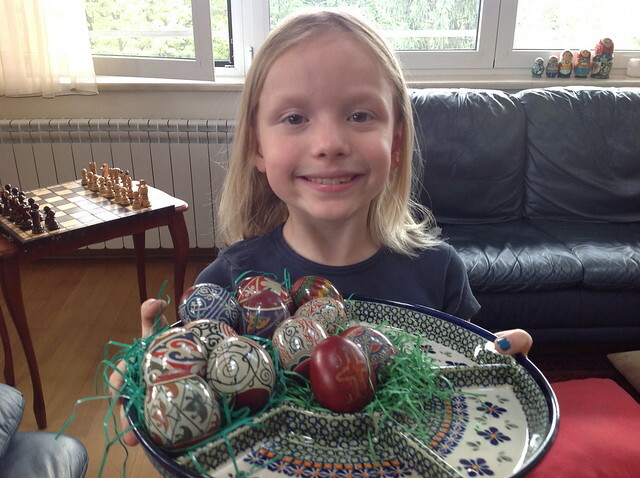 This afternoon we made traditional Serbian Eastern eggs. It was a special occasion today as the Western Christian Easter and the Orthodox Easter fall on the same day. This happens every so often, the next two occasions will be in 2017 and 2025. We went “old school” and got onion skins from the market and boiled the eggs to get the nice red color. If you look closely, I drew a cross and X.B. on the front egg in wax before putting them in the onion dye. X.B. in Cyrillic means “Hristos Vaskrse” (Christ Has Risen). Serbs say this on Easter and one must reply, Vaistinu Vaskrse! (Of course He has Risen!). 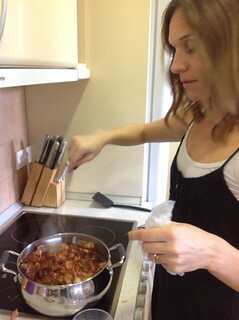 Nadia is boiling the eggs with the onion skins. We next put on some plastic designs from the company, jaje.rs. 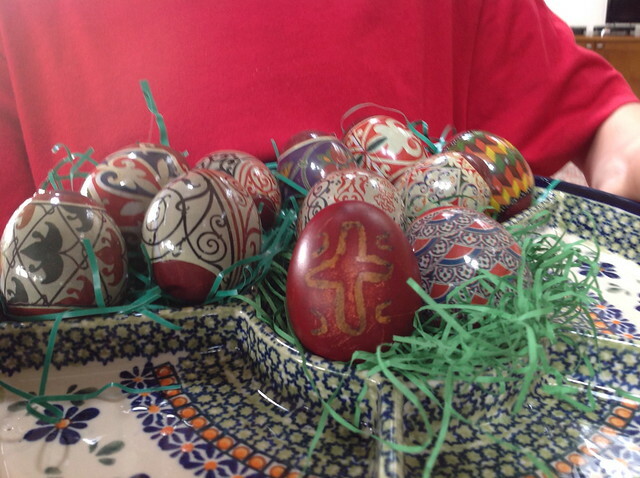 They copy designs from Serbian monasteries in the various styles and are very easy to put on the eggs. As you can see below, they are very beautiful. We will do some egg tapping later today and tomorrow, we will complete the Easter celebrations with a chocolate egg hunt. We are all a bit sad that this will be our last Easter in Serbia, but will definitely pack some more of the jaje.rs monastery designs with us to Japan.